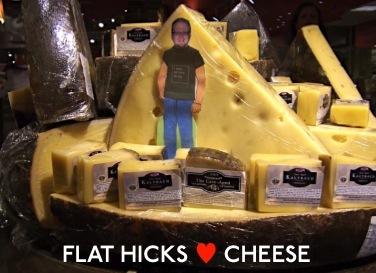 Designer Jon Hicks’ From Design to Deployment, a 50-minute, 100-slide presentation (downloadable slides at the link, unfortunately no video) on building an entire site (seen here: Cheesophile) from the ground up. Lots and lots of pertinent information about web design packed into some of the most concise and high-impact slides that I could spend hours marvelling at. Most of it is stuff I wish someone had neatly summarised for me years ago, but I definitely picked up some good pointers too, e.g. IE6 debuggery* using hasLayout, an old-browser friendly basic CSS file, and the skipLinks feature. Great stuff. So the team and I are building a pseudo-content management system for my workplace (as previously mentioned). With the limited amount of time we have, we’ve been unable to develop a full-fledged system (no rich text editor, no role management, limited input/output flexibility, among other things), though the plan is to launch the bloody site as soon as possible, then figure things out on the back-end as and when the need arises. There was some discussion over email about what our ideal CMS would be like, and Akmal linked us to Swiiit — a local CMS solution that seems promisingly feature-rich. I took a look. Arrgh! The pain! I begin rant. The site itself uses table-based layouts. Not a good sign. Uploading files looks like it *requires* ActiveX, so it’s not cross-platform compatible. They’re running on Commontown, which I’ve heard quite a few nasty remarks about from colleagues who’ve used it. All I know is that among the South Cluster sites they’ve created, none have DOCTYPEs. They have some truly terrible copywriting, and can’t even decide between spelling American (“humanization”) or British (“customisable”). The copywriters leave spaces before punctuation marks — unforgivable in its own right, but I suspect that could be a feature of the system. I’m not sure which is worse. A choice quote: “Did you know ??? Swiiit is so efficient that it can handle uploads at the wink of an eye ? This is due to a robust back end engine which fuels its hunger.” It fuels its hunger! But only on Windows browsers. There’s a “test” link on the (rather unintuitively laid-out) menu right now. 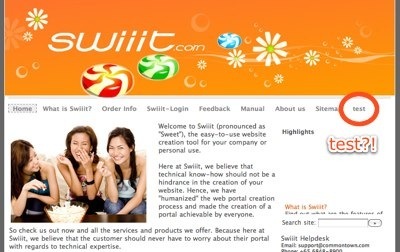 Hint: When you can’t get the domain you want (swiit.com has been squatted on since 2004, these guys registered swiiit in 2006), adding another vowel really doesn’t make your webpage any easier to find. Also amusing: Take a look at the stock photo on the swiiit.com homepage, then at the IPTV World Forum Asia homepage (thanks Steven for that one). Swiiit is awarded the Ministry of Education’s bulk tender “The Provision of Development and Maintenance Services for School Websites” (August 2007). We will endeavour to provide the best services to the schools who are included in this tender and will strive to increase their productivity and communications through the use of Swiiit portals. In my last few months in a position to make or influence IT decisions at work, I’ve come across quite a few truly hideous systems that have been brought in. Some were purchased by previous decision-makers, others were pushed down by the Ministry of Education, and some (I’m ashamed to say) I had a part in approving, tacitly or otherwise. Nobody really knows that most of these vendors are offering some truly horrendous products until it’s too late, and teachers and education administrators just aren’t the sort who bother to go around identifying something better (or if they do, they just aren’t able to convince their bosses that the last $20,000 purchase was wasted). It saddens me that this is happening, but I guess the fact that there’s so much crap lying around the local education scene means there’s a good opportunity for people — especially those who know what schools want — to deliver these needs effectively. Something to think about for the next 2 years and 4 months until the bond is up, I guess. * I’m pretty sure “debuggery” is not the word I’m looking for here.